KANSAS CITY, Kan - The Kansas City T-Bones fought hard, but fell 8-6 to the Sioux City Explorers on a hot Monday night in Kansas City. The T-Bones and Explorers lit up the score board combing for 14 runs, on 23 hits. 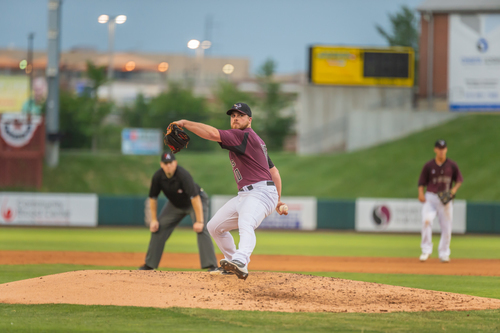 Barret Austin (3-1) struggled, allowing eight earned runs on eleven hits in seven innings pitched for the T-Bones. Nate Samson knocked a homerun over the left field wall in the first inning to give the Explorers an early 1-0 lead. In the bottom of the first, Zach Walters hit an RBI single to center field to score Todd Cunningham from second base. The T-Bones would go on to take a 3-1 lead in the second after Keith Curcio snuck a 2-run homerun over the right field wall. In the third inning, a single by Louis Durango followed by a wild pitch put runners at the corners for the Explorers. Back-to-back 6-3 put outs allowed two runs to score, tying the game 3-3. Sioux City would strike again in the fifth inning. Three consecutive singles by Dylan Kelly, Louis Durango, and Michael Lang loaded the bases for Sioux City. Samson hit a sharply hit single to right field that scored two runs. Jose Sermo hits into a fielder’s choice tacking on another run to extend the lead 6-3. The T-Bones never backed down. In the home half of the fifth, Cunningham hit his second double of the night. Nick Torres hit a single to put runners on first and third for Kansas City. Walters drives in Cunningham from second after an RBI single up the middle. Cal Towey plucked a double to right field that scored Torres and Walters to tie the game 6-6. Two late runs in the 7th and 8th innings helped secure a tough win for the Explorers over the T-Bones. T-Bones went on to lose by a final of 8-6. Brett Austin is credited with the loss tonight. Parker Markel is credited with the win, allowing zero hits, zero runs, and one strike out in one inning pitched. The T-Bones fall to (12-10) on the season. Kansas City trails the (19-5) Explorers by six games in the South Division. The T-Bones and Explorers continue their four-game series Tuesday, June 12 at 7:05.